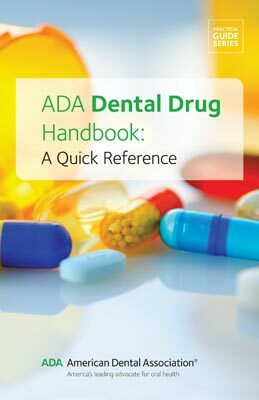 Hand-held drug handbook from ADA features latest information from dental pharmacology's leading experts. Features drugs used in dentistry, such as analgesics, antibiotics, antifungals, antivirals, anxiolytics, fluorides, local anesthetics and corticosteroids. Hand-held drug handbook from American Dental Association. The ADA Dental Drug Handbook contains the latest information from dental pharmacology's leading experts. It covers the drugs most commonly used in the dental practice, with information about dosage, possible interactions, potential complications and more. The guide's hand-held format makes it easy to use in the operatory or catching up in between patients. This easy-to-read reference is the perfect tool for dental professionals at every stage of their career, from practicing dentists to dental students.